Walker nappies 13-18kg 72 pack. New Ultra-Dry layer for faster absorption, and up to 12 hour leakage protection. 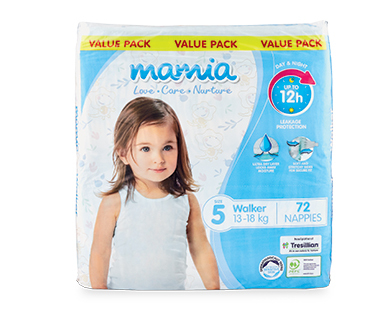 MAMIA® nappies are shaped to fit, featuring a contoured Triple Layer Core. The most advanced MAMIA® core yet provides greater, faster absorption, combined with an even better slim, comfortable fit. Designed to suit each stage of your baby's development, MAMIA® nappies feature greater flexibility and an even better fit with stretchy COMFY FLEX® sides. Your baby will have complete freedom to move while COMFY FLEX® ensures a perfect fit, with overlapping tapes that allow your baby to be extra snug and comfortable. MAMIA® nappies are also unisex. With a full length core that runs from the front to the back of the nappy, they provide extra protection for both girls and boys! With so much technology in one nappy, MAMIA® provides the best protection and peace of mind. Your shopping list is empty.